When an adult has a sudden cardiac arrest, his or her survival depends greatly on immediately getting CPR from someone nearby. Unfortunately, very less number of those people, who experience a cardiac arrest at home, works or in a public location get that help. Most bystanders are worried that they might do something wrong or make things worse. That’s why the guidelines have been simplified but is as effective as more conventional ways to save a life by responders. 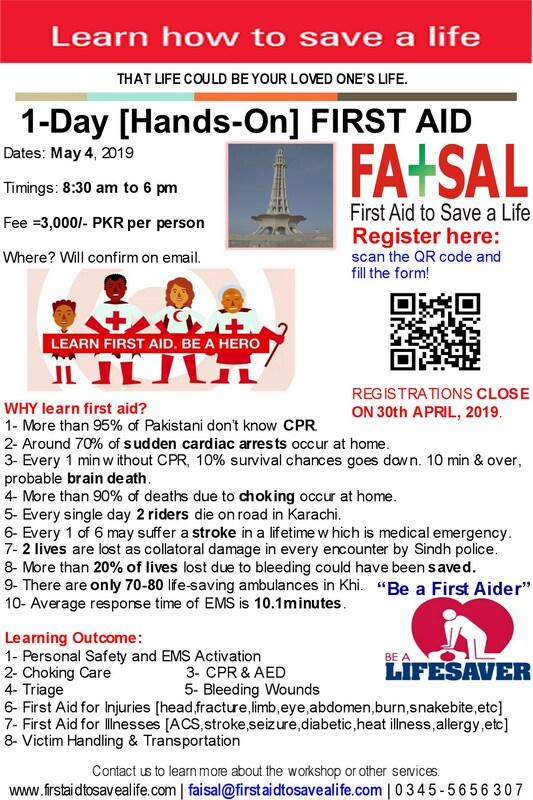 Our these programs are community-focused, comprehensive training programs in emergency resuscitation for the community groups and organizations, medium and high grade students and lay rescuers of all ages. These are designed to teach students how to perform resuscitation for patients of all ages who are victims of Sudden Cardiac Arrest (SCA), as well as those who are unresponsive or choking. Don’t be afraid. Your actions can only help. First Aid for parents is essential, it is vital to know what to do in an emergency situation. It’s not normal to see an adult suddenly collapse, but if you do, call 1122 and push hard and fast in the center of the chest. Don’t be afraid. Your actions can only help. This training program is designed specifically for families. Now you and your family members can learn to provide the best care possible in your own home/venue when it’s convenient for you.